So, HarperCollins is currently accepting unsolicited manuscripts for its science fiction and fantasy imprint, Voyager. If you have a 70,000+ word novel ready to publish, you may want to send it to them. You'll want to act fast, since there is only a two week window. Details here. They were pretty specific about their word count, and seemed to have no exception for YA books, so to give Comet Jack the best chance at being accepted I had to make sure it was at least 70,000 words. I wouldn't want it to get booted out automatically because it measured only 69,000 and change (not including acknowledgements, etc). So I wrote an Epilogue! This was the perfect time to do just that, since I'm working on Comet Jack 2. The Epilogue is the bridge and teaser between the two books. It gives readers of Comet Jack a little more information about the Comet Corps while at the same time giving them a reason to salivate in anticipation of the next book. Early readers of the Epilogue love it, and, while biased, I'm really pleased with it too. If you've read Comet Jack, don't worry. You'll get the Epilogue. Look here for more information shortly. 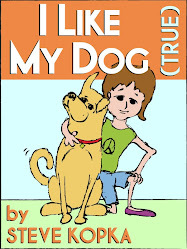 I'm figuring out whether it would be best to make it available here or at Amazon and B&N. Wherever it will be, the Epilogue will be FREE. 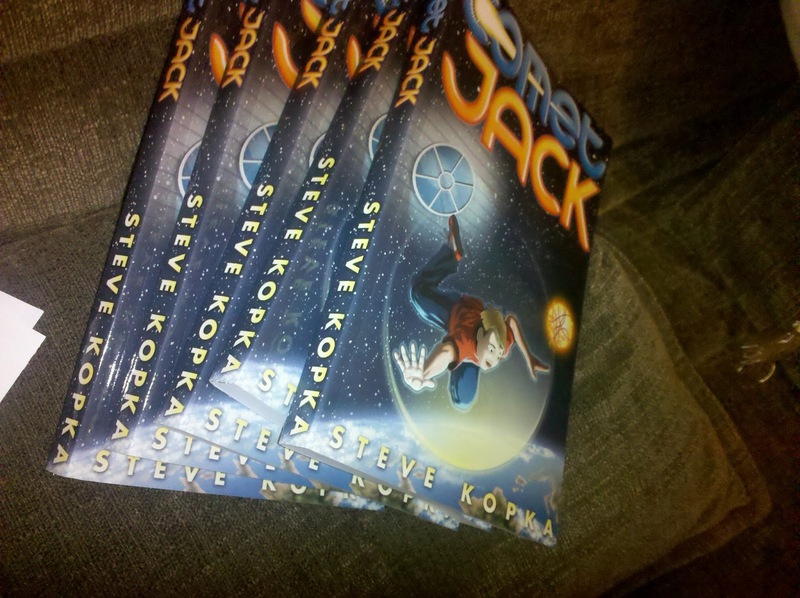 I'm also adding it to future versions of Comet Jack sold on Amazon and Barnes & Noble. Wish me luck with HarperCollins. 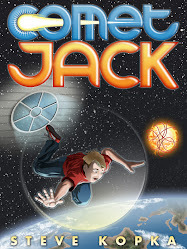 Wouldn't it be cool if Comet Jack (and its sequels and other books!) got a chance to get in front of even more eyes? Yes, I'm working on it. No, it's not done. Yes, I really should have more completed by now. The summer got away from me. What can I tell you? Just a bit. I don't want to give too much away. Also, I find if I tell the story too much before I write it, then it's not as fresh coming out of the pen (well, out of the fingertips into Scrivener, but let's not split hairs). Ink Sketch of Jack checking out his underwater body. In the second book, Jack finds himself on an ocean world, among a sentient water-dwelling species who look at things a little differently than humans do. The action starts at the end of the school year, right before summer vacation. A new tension has built up between Jack and his nemesis, Dirt, and that tension's name is Jennifer Mitchell. Oh, and there's something else going on Earthside: things are coming this way through the window. But that's all I'm going to say for now. I just submitted my YA SF novel to Strange Chemistry, the YA division of Angry Robot books. Angry Robot rules. Among other things, they just released Blackbirds by Chuck Wendig, a colorful and talented writer who also generously shares hilarious, NSFW, spot-on advice perfect for writers (like me!) who are trying to navigate publishing and improve our craft. My novel Admirable Pursuit is for older readers--teens and up. I actually started it well before Comet Jack but finished it after. When I heard (via @ChuckWendig on twitter) that Strange Chemistry, the YA arm of Angry Robot, was running an Open Door, calling for unagented, unpublished, completed YA SF novels, naturally I jumped. I had to jump. I heard about it with just four days left in the 2-week submission window (which ends today, April 30th). As part of the submission process, Strange Chemistry asked for a one-sentence summary of the book. Admirable Pursuit is almost twice as long as Comet Jack. It is told through multiple points of view using short, punchy, action-filled chapters, with an interwoven twisty-turny plot set on two planets and a starship, against a backdrop of ultra-capitalist distopia/utopia (depends on your tax bracket). So, yeah, I couldn't imagine boiling it down to one sentence. 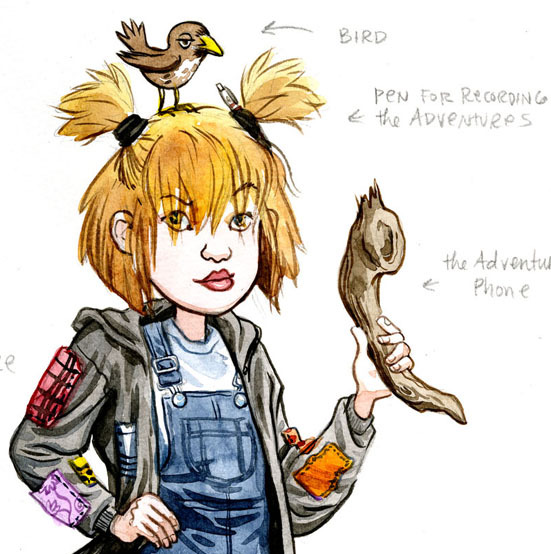 The elevator pitch might be: Indiana Jones meets Dune by way of Blade Runner... for teens! 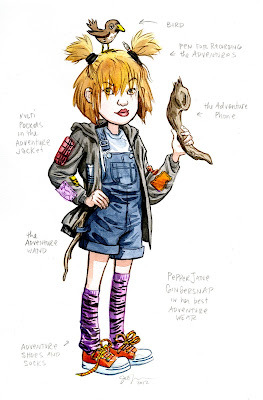 Wendy Veritage, the teenage heir to her Family's fortune, runs away to carve her own path in a future world of haves and have-nots, and ends up in the middle of a battle for humanity's future on a far away planet where a mysterious power allows people to experience their full potential. Strange Chemistry will let me know. 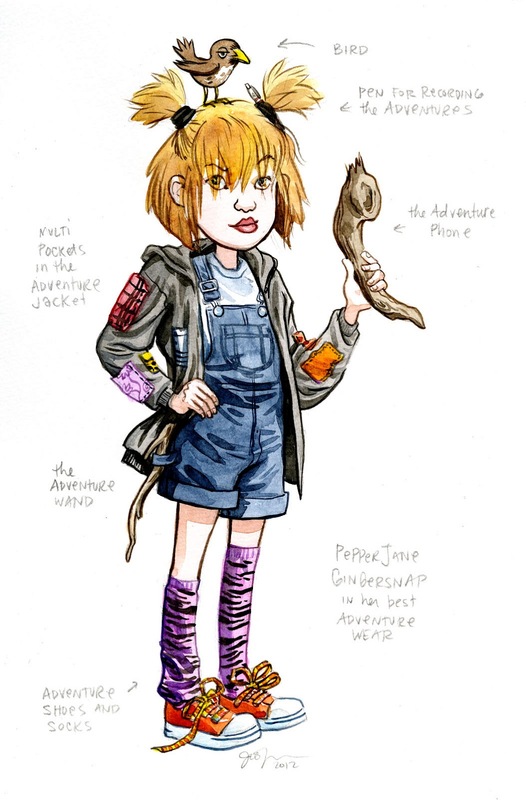 Pepperjane Gingersnap is alive, thanks to the incomparable Jill Thompson! It would not be an exaggeration to say this illustration was created by the "World Famous Jill Thompson." Or "World Famous multiple-Eisner Award-winning Jill Thompson." Here are just a few highlights from her extensive and impressive artistic resumé: creator of Scary Godmother, creator of Magic Trixie, illustrator of countless comics (check out this upcoming Archie cover, for "Occupy Riverdale"). She's worked with Neil Gaiman on Sandman, then created her own successful Endless characters and stories. Last year, the National Cartoonists Society honored her with its prestigious Reuben Award for Beasts of Burden. Jill is the first woman to win a Reuben in the Comic Book category in the Society's 75 year history (that's a mind-blowing statistic right there). The list of her accomplishments goes on and on. I'm lucky enough to know her (and her also World Famous multiple-Eisner Award-winning husband, Brian Azzarello) from a long-running dinner club where we take turns hosting and cooking 4-course meals. Yes, there appears to be a correlation between creative artists and excellent cooks. That's a different story though. Needless to say this is all big, big news for Pepperjane Gingersnap. "Who is Pepperjane Gingersnap?" some of you might be asking. Short answer: A capable adventurer and star of my (and now my and Jill's!) upcoming chapter book. Stay tuned for more details. The award itself makes some self-published people nervous. You get $15,000 (sweet!) and Penguin publishes your book (sweet!). However, they own the first rights to it then, and self-published authors are all about owning our rights. Basically, what you're winning is a one-book publishing deal. The potential downside? You might be able to make more money on your own. I'm not as concerned about that right now, for several reasons. Second, if I did win, the publicity and $15,000 would probably be worth what I'm signing away. (And I'll double-review that if it comes up.) I might not be as cavalier about this if this were my one and only Work of Art baby. I guess I kind of figure if I end up making a mistake and feel burned, I just won't do that again. I already have several more books "in the pipeline" (and by that I mean in various states of completion and editing). 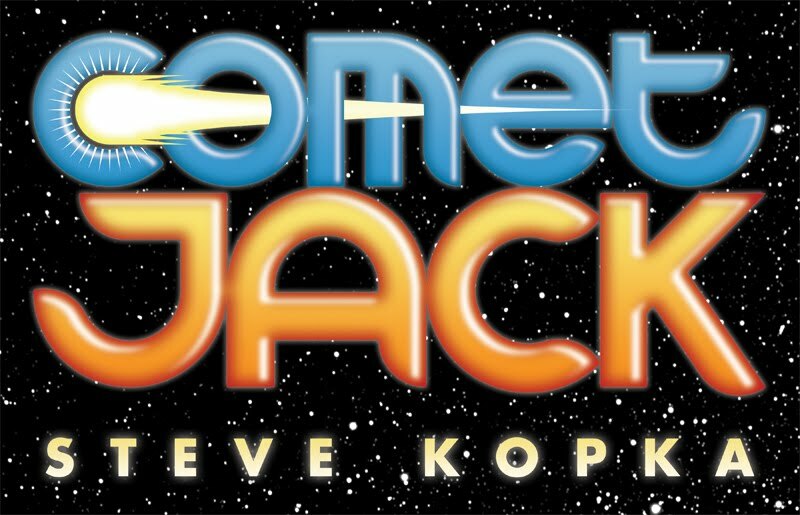 It's even possible that Comet Jack #2 will be on the virtual shelves, available for sale, before the contest is even over. Some other works certainly will. 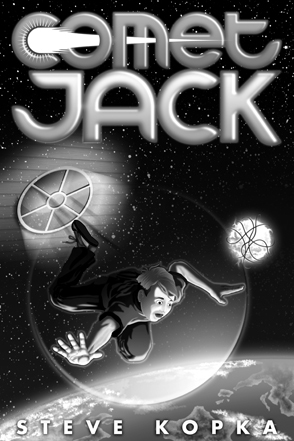 Third, Comet Jack is still available for purchase during the contest period. Nothing has changed! Yes, under contest rules, I'm forbidden from shopping it to agents (and that certainly might turn some folks off who are pursuing that route), but since Comet Jack is already out and selling some copies, this doesn't bother me one bit. So, there you have it. In case you were interested in how I justified entering this contest. You might also be interested to know that it took longer to write this post than it did to enter the contest.